The usefulness of dividing philosophy into Western philosophy and other philosophies is open to challenge, not the least for speaking down to those other philosophies. To say this is not to deny that there are important traditions in philosophy that are intimately bound up with historical and geographical circumstances. The term Eastern philosophy refers very broadly to the various philosophies of India, Iran, China, and Japan. 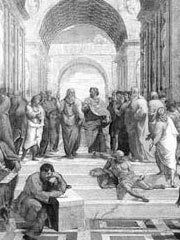 When one uses the term «philosophy» in an academic context, it typically refers to the philosophical tradition begun with the ancient Greeks. The «Eastern philosophies» are typically overlooked. Hinduism (सनातन धर्म; Sanātana Dharma, roughly Perennial Faith) is generally considered to be the oldest major world religion still practised today and first among Dharma faiths. Hinduism is characterized by a diverse array of belief systems, practices and scriptures. It has its origin in ancient Vedic culture at least as far back as 3000 BC. It is the third largest religion with approximately 1.05 billion followers worldwide, 96% of whom live in the Indian subcontinent. Hinduism rests on the spiritual bedrock of the Vedas, hence Veda Dharma, and their mystic issue, the Upanishads, as well as the teachings of many great Hindu gurus through the ages. Many streams of thought flow from the six Vedic/Hindu schools, Bhakti sects and Tantra Agamic schools into the one ocean of Hinduism, the first of the Dharma religions. Also, the sacred book Bhagavad Gita is one of the most revered texts among Hindus. Zoroastrianism is the earliest known monotheistic religion. Zoroastrianism has a dualistic nature (Ahura Mazda and Angra Mainyu), with an additional series of six important angel-like entities called the Amesha Spentas. In modern Zoroastrianism they are interpreted as aspects or emanations of Ahura Mazda (the Supreme Being), who form a heptad that is good and constructive. They are opposed to another group of seven who are evil and destructive. It is this persistent conflict between good and evil that distinguishes Zoroastrianism from monotheistic frameworks that have only one power as supreme. By requiring its adherents to have faith and belief in equally opposing powers Zoroastrianism characterizes itself as dualistic. Zoroastrianism may also be known as Mazdayasna («Worship of Wisdom») by some of its followers after the Zoroastrian name of God, Ahura Mazda («Divine Wisdom»). A modern Persian form is Behdin («Good Religion/Law,» see below for the role of daena Law). Zoroastrians may refer to themselves as Zartoshti («Zoroastrians»), Mazdayasni («Wisdom-Worshippers») and Behdini («Followers of the Good Religion»), and Zarathustrian. The rise of Islam led to emergence of various philosophical schools of thought. Amongst them sufism established esoteric philosophy, mu’tazilah (inspired from Greek Philosophy) reconstructed rationalism while asharites cast significant impact on the non-reliability of reason and reshaped logical and rational interpretation of God, justice, destiny and universe. Sufism (تصوف taṣawwuf) is a school of esoteric philosophy in Islam, which is based on the pursuit of spiritual truth as a definite goal to attain. In order to attain this supreme truth, Sufism has marked Lataif-e-Sitta (the six subtleties), Nafs, Qalb, Sirr, Ruh (spirit), Khafi and Akhfa. Apart from conventional religious practices, they also perform Muraqaba (meditation), Dhikr (Zikr or recitation), Chillakashi (asceticism) and Sama (esoteric music and dance). al-mu`tazilah (المعتزلة) or Mu’tazilite is another controversial theological school of philosophy in early Islam. They called themselves Ahl al-‘Adl wa al-Tawhid («People of Justice and Monotheism»). They were the first who advocated free will and expanded the (western) rationalism in Islamic society. They also developed Kalam based on Greek dialectic. They ascended dramatically during 8th and 9th century due to support of intellectual and elites, but could not appeal to the masses. Later in the 13th century, they lost official support and most of their valuable works were destroyed. Confucianism（儒学）, developed around the teachings of Confucius(孔子) and is based on a set of Chinese classic texts. It was the mainstream ideology in China and the sinosphere since the Han dynasty and may still be a major founder element in Far-East culture. It could be understood as a social ethic and humanist system focusing on human beings and their relationships. Confucianism emphasizes formal rituals in every aspect of life, from quasi-religious ceremonies to strict politeness and deference to one’s elders, specifically to one’s parents and to the state in the form of the Emperor. Taoism(道教), whose essence is centered around letting things take their natural course, is the traditional foil of Confucianism. Taoism’s central books are the Tao Te Ching, traditionally attributed to Lao Zi (老子/Lao tse), and the Zhuang Zi (庄子/Chuang Tse). The core concepts of Taoism are traced far in Chinese History, incorporating elements of mysticism dating back to prehistoric times, linked also with the Book of Changes (I Ching), a divinatory set of 64 geometrical figures describing states and evolutions of the world. Taoism emphasizes Nature, individual freedom, refusal of social bounds, and was a doctrine professed by those who «retreated in mountains». At the end of their lives —or during the night, Confucian officers often behaved as Taoists, writing poetry or trying to «reach immortality». Yet Taoism is also a government doctrine where the ruler’s might is ruling through «non-action» (Wu wei). Buddhism is a system of beliefs based on the teachings of Siddhartha Gautama, an Indian prince later known as the Buddha, or one who is Awake — derived from the Sanskrit ‘bud’, ‘to awaken’. Buddhism is a non-theistic religion, one whose tenets are not especially concerned with the existence or nonexistence of a God or gods. The Buddha himself expressly disavowed any special divine status or inspiration, and said that anyone, anywhere could achieve all the insight that he had. The question of God is largely irrelevant in Buddhism, though some sects (notably Tibetan Buddhism) do venerate a number of gods drawn in from local indigenous belief systems. Most Buddhist sects believe in karma, a cause-and-effect relationship between all that has been done and all that will be done. Events that occur are held to be the direct result of previous events. One effect of karma is rebirth. At death, the karma from a given life determines the nature of the next life’s existence. The ultimate goal of a Buddhist practitioner is to eliminate karma (both good and bad), end the cycle of rebirth and suffering, and attain Nirvana, usually translated as awakening or enlightenment. Zen is a fusion of Mahayana Buddhism with Taoist principles. Bodhidharma was a semilegendary Indian monk who traveled to China in the 5th century. There, at the Shaolin temple, he began the Ch’an school of Buddhism, known in Japan and in the West as Zen Buddhism. Zen philosophy places emphasis on existing in the moment, right now. Zen teaches that the entire universe is one’s mind, and if one cannot realize enlightenment in one’s own mind now, one cannot ever achieve enlightenment. Jainism was founded by Mahavira, a teacher and religious leader who lived around the same time as the Buddha. The word Jaina comes from the title Jina, or victorious one, referring to those who have achieved victory over their own passions. Jainism teaches asceticism — acts of self-discipline, self-deprivation, and self-denial — as the way to enlightenment. The original Jains were among the world’ first monks, retreating from ordinary life to devote themselves to fasting and meditation. The Jain population is concentrated in India and has crossed 10 million. Jains are among the most prosperous of business communities in India. Maoism is a Communist philosophy based on the teachings of 20th century Communist Party of China revolutionary leader Mao Zedong. It is based partially on earlier theories by Marx and Lenin, but rejects the urban proletariat and Leninist emphasis on heavy industrialization in favor of a revolution supported by the peasantry, and a decentralized agrarian economy based on many collectively worked farms. Many people believe that though the implementation of Maoism in Mainland China led to the victory of communist revolution, it also contributed to the widespread famine, with millions of people starving to death. Chinese Communist leader Deng Xiaoping reinterpreted Maoism to allow for the introduction of market economics, which eventually enabled the country to recover. As a philosophy, Deng’s chief contribution was to reject the supremacy of theory in interpreting Marxism and to argue for a policy of seeking truth from facts. Despite this, Maoism has remained a popular ideology for various Communist revolutionary groups around the world, notably the Khmer Rouge in Cambodia, Sendero Luminoso in Peru, and an ongoing (as of early 2005) Maoist insurrection in Nepal. Shinto is the indigenous religion of Japan, a sophisticated form of animism that holds that spirits called kami inhabit all things. Worship is at public shrines, or in small shrines constructed in one’s home. Many have argued that the distinction between Eastern and Western schools of philosophy is arbitrary and purely geographic, that this artificial distinction does not take into account the tremendous amount of interaction between European and Asian schools of thought, and that the distinction is more misleading than enlightening. Furthermore, it has been argued that the term Eastern philosophy implies similarities between philosophical schools which may not exist and obscures the differences between Eastern schools of philosophy. For example, Indian and Western schools of thought, with their robust mind-body conceptual dualism, share consequent tendencies to subjective idealism or dualism. Formally, they share the rudiments of Western «folk psychology» —a sentential psychology and semantics e.g. belief and (propositional) knowledge, subject-predicate grammar (and subject-object metaphysics) truth and falsity, and inference. These concepts underwrote the emergence (or perhaps spread) of logic in Greece and India (In contrast to pre-Buddhist China). Other noticeable similarities include structural features of related concepts of time, space, objecthood and causation — all concepts hard to isolate within ancient Chinese conceptual space. Because of the influence of monotheism and especially the Abrahamic religions, Western philosophies have been faced with the question of the nature of God and His relationship to the universe. This has created a dichotomy among Western philosophies between secular philosophies and religious philosophies which develop within the context of a particular monotheistic religion’s dogma regarding the nature of God and the universe. Eastern philosophies have not been as concerned by questions relating to the nature of a single God as the universe’s sole creator and ruler. The distinction between the religious and the secular tends to be much less sharp in Eastern philosophy, and the same philosophical school often contains both religious and philosophical elements. Thus, some people accept the metaphysical tenets of Buddhism without going to a temple and worshipping. Some have worshipped the Taoist deities religiously without bothering to delve into the philosophic underpinnings, while others embrace Taoist philosophy while ignoring the religious aspects. This arrangement stands in marked contrast to most philosophy of the West, which has traditionally enforced either a completely unified philosophic/religious belief system (e.g. the various sects and associated philosophies of Christianity, Judaism, and Islam), or a sharp and total repudiation of religion by philosophy (e.g. Nietzsche, Marx, Voltaire, etc.). Another common thread that often differentiates Eastern philosophy from Western is the belief regarding the relationship between God or the gods and the universe. Western philosophies typically either disavow the existence of God, or else hold that God or the gods are something separate and distinct from the universe. This comes from the influence of the Abrahamic religions, which teach that this universe was created by a single all-powerful God who existed before and separately from this universe. The true nature of this God would be incomprehensible to us as his creations. It has been argued that in most Western philosophies, the same can be said of the individual: Western philosophies generally assume as a given that the individual is something different from the universe, and Western philosophies attempt to describe and categorize the universe from a detached, objective viewpoint. Eastern philosophies, on the other hand, typically hold that people are an intrinsic and inseparable part of the universe, and that attempts to discuss the universe from an objective viewpoint as though the individual speaking was something separate and detached from the whole are inherently absurd. There have been many modern attempts to integrate Western and Eastern philosophical traditions. German philosopher Georg Wilhelm Friedrich Hegel was very interested in Taoism. His system of dialectics is sometimes interpreted as a formalization of Taoist principles. Hegel’s rival Arthur Schopenhauer developed a philosophy that was essentially a synthesis of Hinduism and Buddhism with Western thought. He anticipated that the Upanishads (primary Hindu scriptures) would have a much greater influence in the West than they have had. However, Schopenhauer was working with heavily flawed early translations (and sometimes second-degree translations), and many feel that he may not necessarily have accurately grasped the Eastern philosophies which interested him. Recent attempts to incorporate Western philosophy into Eastern thought include the Kyoto School of philosophers, who combined the phenomenology of Husserl with the insights of Zen Buddhism. Watsuji Tetsurô, a 20th century Japanese philosopher attempted to combine the works of Søren Kierkegaard, Nietzsche, and Heidegger with Eastern philosophies. There is also some have claimed a definite eastern element with in Heidegger’s philosophy, although for the most part this is not made explicit within Heidegger’s philosophy, apart from in the dialogue between a Japanese and inquirer. Heidegger did spend time though attempting to translate the Tao Tse Ting into German, working with his Chinese student Paul Hsaio. It has also been claim that much of Heidegger’s latter philosophy, paticularly the sacredness of Being, bares a distict similarity to Taoist ideas. It may even be that Heidegger’s philosophy might be read ultimatly as an attempt to ‘turn eastwards’ in responce to the crisis in western civilisation. This however is only an interpretation. There are clear parallels between Heidegger and the work of Kyoto Schoo.